Hotel Strandly Skagen Skagen, Hotel Denmark. Limited Time Offer! Hotel Strandly Skagen. 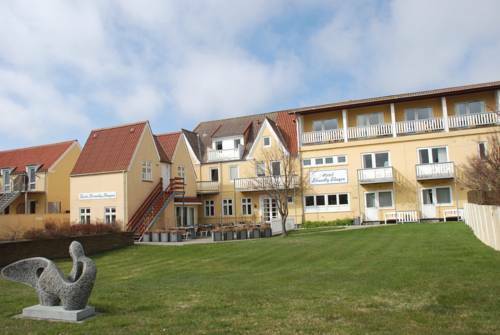 "Hotel Strandly Skagen" is a hotel that has received 3 stars. This hotel is an excellent base point from which to explore Skagen. Sea lovers have the opportunity to spend some time at the sea side, which is conveniently located near the hotel. 30 rooms are featured. Start your day with a little stroll in the private garden or the patio. There are many sports offered to make your stay more active. Take part in fishing, mini-golf, birdwatching, tennis, sailing, golf, bowling and kayaking, for instance. Furthermore, there is a gym, boats, a running track and a walking trail as well as a bicycle rental service. Dinner can be enjoyed without leaving the hotel as there is an onsite restaurant. In the evening, you can have a drink at the lounge bar. To add to your stay, breakfast is included in the price.